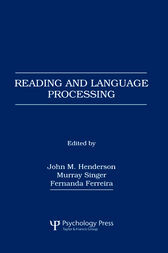 This volume was designed to identify the current limits of progress in the psychology of reading and language processing in an information processing framework. Leaders in their fields of interest, the chapter authors couple current theoretical analyses with new, formally presented experiments. The research -- cutting-edge and sometimes controversial -- reflects the prevailing analysis that language comprehension results in numerous levels of representation, including surface features, lexical properties, linguistic structures, and idea networks underlying a message as well as the situations to which a message refers. As a group, the chapters highlight the impact that input modality -- auditory or written -- has on comprehension. Finally, the studies also capture the evolution of new topic matter and ongoing debates concerning the competing paradigms, global proposals, and methods that form the foundation of the enterprise. The book presents current accounts of research on word-, sentence-, and text-processing. It will prove informative for experimental psychologists as well as investigators in cognitive science disciplines such as computer science, linguistics, and educational psychology. The book will also be very helpful to graduate students who wish to develop expertise in the psychology of language processes. For them, it collects, in a single volume, readings that are representative of progress concerning many central problems in the field. As such, it is distinct from the numerous collected volumes that concentrate on a single issue. Complete author and subject indexes facilitate effective use of the volume.